Smiths Pub was packed on Wednesday evening, and they were all looking for one thing. 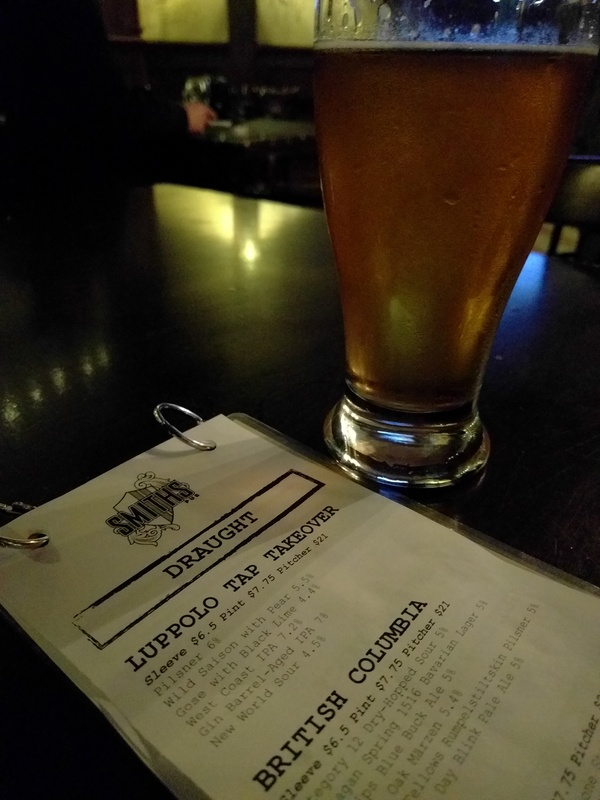 Luppolo Brewing, based out of Vancouver, was featured in the most recent version of the local pub’s tap takeover series. Bringing over a selection of beer including their Pilsner, Black Lime Gose, West Coast IPA, Peach Table Beer, and Gin Barrel-Aged IPA, there was a wide range of beer styles to try. Some lasted just hours and disappeared quickly, like their Wild Saison with Pear, which recently won Bronze at the Canadian Brewing Awards in Ottawa. Unfortunately, their Sour was unavailable, but this opened to the door to their Peach Table Beer being a nice finish later in the evening, and the crisp fruitiness and refreshing lightness did not disappoint. An interesting fact is that this was Luppolo’s first tap takeover, and if the turnout was any indication, expect to see more of their fantastic brews on the Island. Keep an eye out for the next tap takeover, as that will likely be another draw that will empty some kegs early on in the evening.